Need to rent a bike? Click here for the bike rentals and bike sales. There are many opportunities to get off the trail and visit a beach. Food and water are also readily available and public restrooms can be found at Nickerson State Park, Salt Pond Visitors Center at Cape Cod National Seashore and the National Seashore Headquarters. If you do not have a bike, bike rentals are available at many points along the way. For people with disabilities, a limited number of hand-cycles are available for rent at specific bike concessions. For more information call Nickerson State Park at 508-896-3491. Before the first railroad tracks were laid, the Cape was a relatively isolated area, accessible only by packet boat or stagecoach. By 1848, the Old Colony Railroad Company laid tracks that connected Boston and Sandwich. Railroad track extensions continued and by 1873, Old Colony had linked Boston with Cape Cod’s outermost point of Provincetown, offering a miraculously short, five-hour journey. As the Cape’s popularity as a summer resort increased, the railroad was heavily used to transport visitors from New York and Connecticut, as well as other parts of Massachusetts. With the growing number of visitors came train-loads of food and other provisions needed to meet their needs. But the railroad’s importance was soon surpassed by the automobile. Bridges to carry cars over Cape Cod Canal were opened in 1935, and in 1937 passenger service to the towns east of Dennis ended. Trains continued to haul freight until the mid-1960’s, but then the tracks were torn up and the station-houses were razed or vandalized. If you look carefully as you ride along the trail, you can still see occasional relics of the Cape’s rail days. 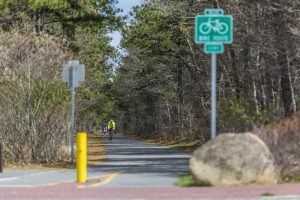 Cape Cod Rail Trail — Mid, Lower & Outer Cape: When freight rail cars stopped rolling around the Cape years ago, someone had the brilliant idea of pulling up those miles and miles of track and paving it over as a bike trail. Now, every year, thousands of cyclists of all ages don their helmets and hop on the Rail Trail. It begins in Dennis: access on Rt 134 — look for signs across from the Mid Cape Home Center. It roams through forests, fields, marshes and cranberry bogs all the way to Wellfleet. It’s a nice, safe place to ride … but remind your kids to stay on the right! Harwich: access on Rt 124, near the parking area adjacent to Rte 6, or off Great Western Road. Brewster: access and parking on Underpass Road at the Rail Trail Bike Shop, or at Nickerson State Park on Rt 6A. Orleans: access on Main St. beside the Mid-Cape Home Center store or on Rock Harbor Rd. Eastham: access and parking at the Salt Pond Visitor Center, Wellfleet access behind the South Orleans General Store, free parking available. The terrain is flat and straight, good for walking, biking and horseback riding. There is a gradual slope. CHATHAM: Rte. 137 at Rte. 28 intersection ? Winifred Rd, off Old Queen Anne Rd. TRURO: Head of the Meadow Beach Parking Lot ? High Head Rd.